Yesterday’s trading session for the eurodollar ended with a widespread candle which once again validated the doji cross signal of three days ago and further confirmed, if evidence were needed, that the outlook for the euro continues to remain heavily bearish. As discussed many times before in recent days the key technical level has now been established at USD1.2141, and once again this area was tested in yesterday’s trading. 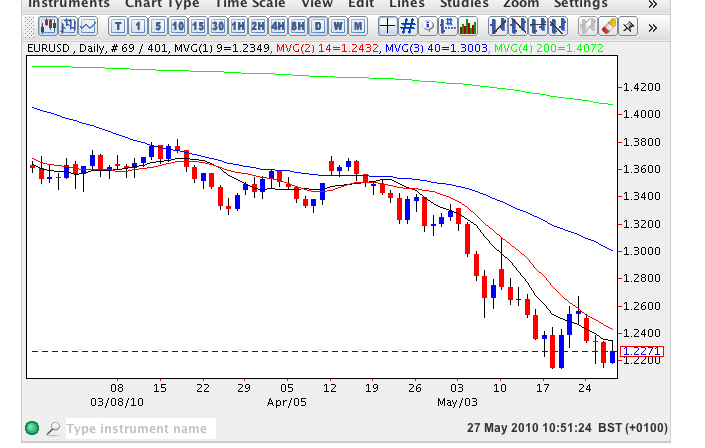 Overnight the euro rallied somewhat but immediately ran into resistance from the 9 day moving average and has subsequently pulled back once again currently trading at USD1.2264, down from the session high on news that China is reviewing its holdings of Euro bonds. As we build a platform in this price area then the longer any consolidation continues, the more likely we will see a significant rebound. However, at present this looks unlikely and for the time being we need to wait until the pair close a session at USD1.21 which will then signal a further sustained bearish move lower and open the way for longer term short positions once again. With no significant fundamental news in Europe the markets will be looking at the US where we have the simultaneous release of the preliminary GDP figures and unemployment claims. Preliminary GDP is forecast to come in at 3.5% whilst the unemployment claims are expected at 450k, a modest decline from the previous 471k. Should either (or both) of these numbers deviate from their respective forecasts then expect some volatility.